UWP apps appear to be the future. 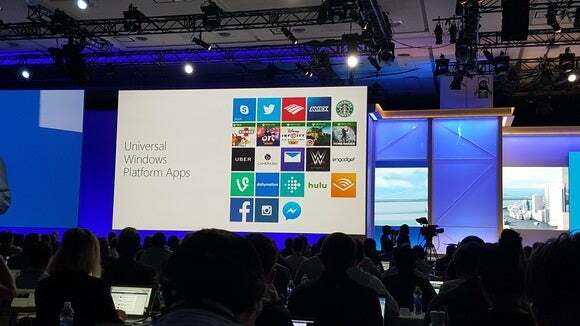 At the Build keynote, Microsoft touted new Universal Windows Platform apps that are coming to the Windows Store, including what appears to be a concerted push from Facebook. 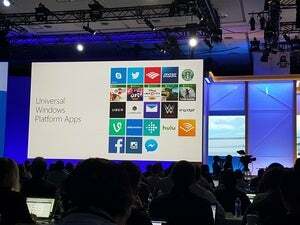 Microsoft’s OS chief, Terry Myerson, put up a slide that shows a number of new universal apps coming to the Windows Store, including Bank of America, American Express, the World Wrestling Entertainment, and many more. Perhaps more importantly, Myerson said that Facebook’s key apps would be released as universal apps, including the main Facebook app and Facebook Messenger. Facebook will also bring its Facebook Audience Network to UWP, allowing 3 million Facebook advertisers to reach Windows customers, Myerson said. Microsoft’s UWP apps have been the source of some controversy ever since Epic’s CEO, TIm Sweeney, complained that with UWP, Microsoft was shutting its app store to third-party software. Microsoft has responded by saying it will allow modifications to UWP apps. The most important appeal of UWP apps, however, is the fact that they will run on all Windows 10 platfoms, including phones, tablets, the Xbox One, the HoloLens, and more. That’s important, given that Windows 10 phones have lacked a number of banking apps—the addition of American Express and Bank of America adds those apps back to those platforms. Microsoft also announced that it had developed a “desktop app converter,” also known as Project Centennial, to take an existing Win32 app—the format that Windows users are used to—and convert it to an UWP app. It will be easy to bring the existing 16 million Win32 and .Net apps to the Windows Store, Microsoft executives said. With Microsoft’s recent acquisition of Xamarin, users can use the Xamarin toolset to more easily bring Android and iOS apps to the Windows platform as well.